If you love everything to do with Christmas you should not pass up the chance to have a go on this fun and festive slot by Microgaming! Santa himself seems to have embraced 21st century life, and has traded in his trusty reindeers and sleigh for a shiny new motorbike. He whizzes around against an aerial background of a city at night, as people wait in anticipation for their gifts to be delivered. Players can certainly look forward to some presents of their own, as well as some tasty nibbles. Symbols include iced biscuits, mince pies, pints of beer, and rich Christmas puddings! Microgaming Software Systems have been operating since 1994 and are based in the Isle of Man. Since then they have retained a position at the forefront of the online gaming industry. 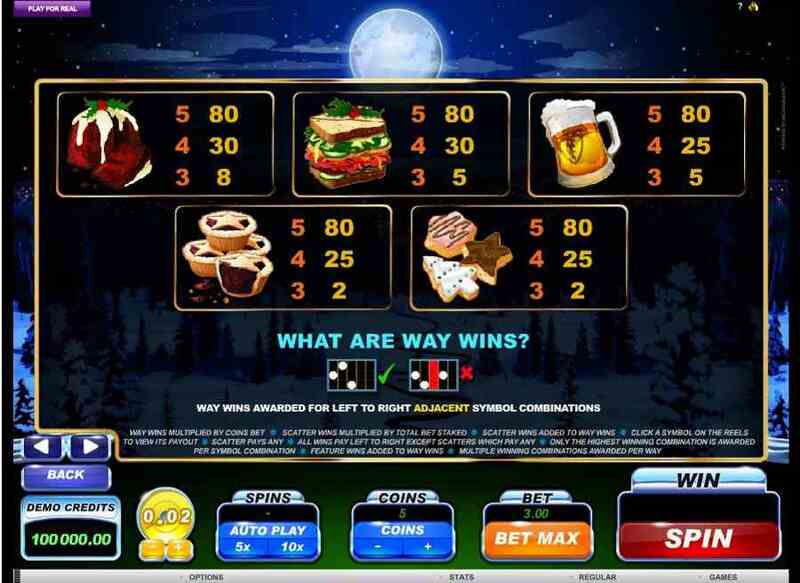 For a similarly festive slot from Microgaming, have a go at ‘Scrooge’. Find our UK slot games here. You can activate 25 free spins by helping Santa find the keys to his motorbike. If you reveal 3 Scatter key icons at any one time you will trigger the free spins, but not only that you will double your current winnings! During the free spins round, players can choose which of the following bonus features they want to activate: stacked wilds, expanding wilds, or trailing wilds. Furthermore, during the free spins players can look forward to the chance to get their hands on the jackpot – a whopping 1,900,000 coins! You can visit here if you are in search of games with high jackpots to the initial wager ratio! The food and drink themed symbols may be tasty but they are the least valuable symbols on the board – lining up 5 matching symbols will multiply your line bet by 5. Bigger wins can be secured by lining up more valuable symbols. 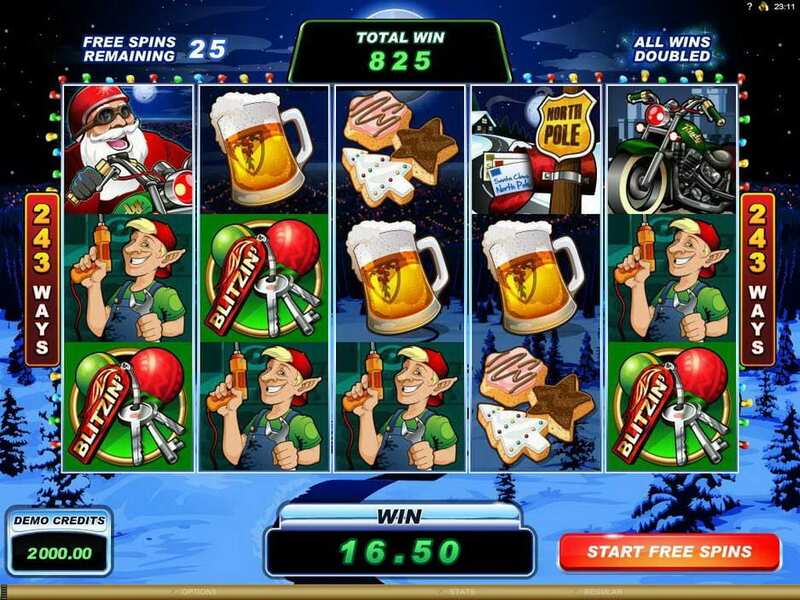 5 of the North Pole sign will win you 100x your bet, and 5 of the motorbike rewards you with 125x. Santa himself is of course the highest paying normal symbol in this game, offering 200x your stake if you can 5 of these jolly guys. Though Santa opts for motorbikes over reindeer these days, the reindeer by no means become obsolete. Players should keep a watchful eye out for the reindeer Scatter symbol, for when 5 appear anywhere on the screen you will be rewarded with 50x your total stake! The Wild symbol is the Santa’s Wild Ride logo – it substitutes in for any symbol other than the reindeer Scatter, and also applies a random multiplier of up to 4x when it is part of a winning combination. You should also keep an eye on reels 2 and 4, for Santa might accidentally drop some presents on these reels – if you spot one click on it quick and you will be rewarded with a random prize! Though some Grinches out there might not be thrilled at the prospect of another festive slot, we love the modern twist Microgaming has put on this slot. This is a 5 reel slot offering a maximum bet of 7.50 coins per spin. With 243 ways to win, players can look forward to fast and frequent wins, and given the maximum bet is only 7.50 it is better suited to newbies or low-budget players.